Block Man isn't the only playable Mega Man 11 stage at E3. After the jump below, check out several minutes of live, off-screen footage of Fuse Man's stage. We don't get to see the actual fight against Fuse Man, though there's quite a bit of new, never-before-seen stuff here. 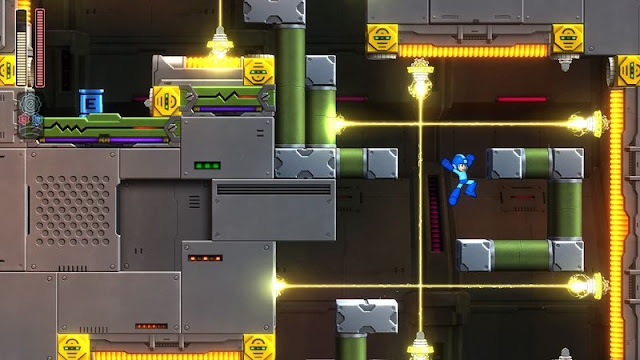 As a reminder, there is a second official Mega Man 11 live stream tomorrow on Capcom USA's official Twitch (12:00pm PST). Perhaps they'll play through all of Fuse Man's stage? I’m so amped for this game, it’s ridiculous! love the stage design. still looks like the gear system is not needed. but useful enough. can't wait for other stages. Block Man's stage is okay, but Fuse Man's stage looks awesome. I'm really digging it.